Ok before I get into this one, I'm just going to say if you haven't read the first two books you may want to stop here because some of the stuff that I'm going to mention happened in previous books and I admit I'm not up for spoiler tags, however, I don't plan on mentioning any major plot points and will keep it to smaller things. It's Sebastian and Calvin!!!! I'm really, really loving these two and this book has cemented them with me. I was more than a little impressed with the first book and book two also went fairly well but this one...Sweetbabyjebus!!!! I loved it. From start to finish this story had my full attention. After having his apartment destroyed in the last book, Seb's needing a new home and so he and Calvin are taking the next step and they've found a place of their own. Calvin's got a dog and he's seeing a counselor (this is a previous story thing). Once again Sebastian is faced with a mystery with origins in the past and this time it goes back to the beginnings of the golden age of film...or more accurately the beginnings of film. When Sebastian receives a mysterious package at his shop. Inside he finds a Thomas Edison Kinetoscope a 19th century movie viewer but there's so much more to this than it appears. As Sebastian gets drawn further into the mystery things begin to become complicated and not everything or everyone is as it seems. But add in to these events the appearance of someone from Calvin's past and Neil, Seb's ex and you've got a story that's teeming with twist and turns. From start to finish I was kept guessing and wonderfully entertained with this one. Calvin and Sebastian are definitely evolving as a couple and I loved seeing them grown and their interactions had some very definite humorous moments. Along with Calvin and Seb's relationship growth, we're treated to some personal growth on the part of Seb and Neil, as they both evolve from bitterness over their failed relationship to a friendship that just might still be tinged with a bit of sarcasm on both their parts. Sarcasm that also held a touch of affection as Seb and Neil both realize that the biggest problem they'd ever faced was that they were really only ever meant to be friends. Back when the first book was released in this series there were mentions of another well loved cop & shop owner pairing and the resemblance that Calvin and Sebastian held to them, which is something that I'm not trying to dispute because I truly feel this is a matter of personal perspective so I'm not looking for a right or wrong here because I don't think there is one, but I would just like to say that for a number of reasons with this book I think Sebastian and Calvin have firmly moved themselves out of that shadow and are standing in a spotlight that is all their own. Now there's just one other thing that I'd like to mention and that's the ending...which, I'm simply going to say I loved it. The ending of this book for me was totally perfect...I loved it and yes, I'm so on board for more of these two men and I can't wait for what's coming next or at least I hopefully I won't have to wait too long, maybe...please? 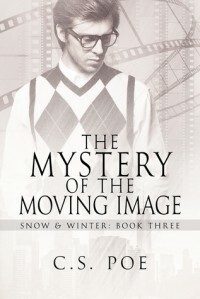 An ARC of 'The Mystery of the Moving Image' was graciously provided by the publisher in exchange for an honest review.